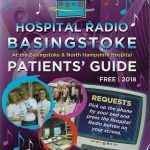 Hospital Radio Basingstoke is getting ready to join 50 other hospital radio stations around the UK and Ireland for the 3rd New Year's Eve Big Broadcast. The show will be hosted by Richard Smith and his team and will be live for 20 hours from 4pm on New Year's Eve. There will be special guests, requests and HRB will be up against Preston Hospital Radio in the Sausage Sandwich Quiz on New Year's Day trying to win a £10 gift card for an HRB listener. Finally Alan "Voice of the Balls" Dedicoat, who is also the Patron of the Hospital Broadcasting Association will announce the shortlists for the 2015 National Hospital Radio Awards which will be held in Newcastle next March. The New Year's Eve Big Broadcast, Live on HRB from 4pm on New Year's Eve.